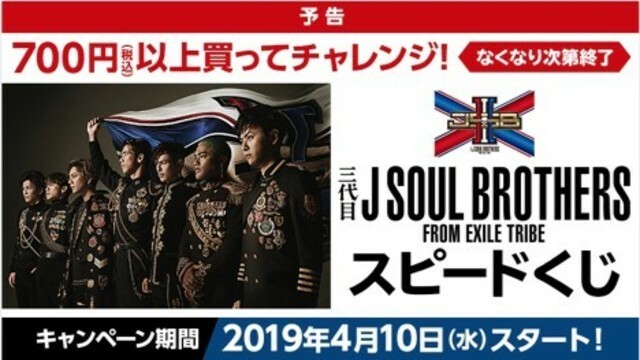 "J SOUL BROTHERS III's Instant Lottery Campaign" will be launched in LAWSON stores on 4/10 (Wed.)! Customers who spend 700 yen (tax included) at a time can participate in the instant lottery campaign once and get lottery tickets to win deluxe prizes including vouchers, coupons, original goods and application tickets to premium event with appearances of the members! All lottery tickets feature J SOUL BROTHERS III Photo Card (7 types)! Visit the campaign site for details!! *The campaign will end once there is no lottery ticket left.